Description: ICG 1212, 1216, SOO 745, and 786. Description: ICG 9615 (John Logan), 9637 (Charles Markham), SOO 745, and 786. Description: SOO SD40 745 near Rosemont, Illinois on an unknown day in July 1982, Ektachrome by Chuck Zeiler. Description: Can see crew members riding in the first and second unit as this train heads towards Superior after just departing Solon Springs, WI. Well maintained ROW was a Soo Line trademark. Title: Arriving at Stinson Yard. Description: The same train that caboose 123 was on has now arrived at Stinson Yard in Superior. I like the old yard office/depot on the left. Not sure what is left of this scene in 2016. Description: Since posting the other shots in this sequence, I had wondered where the closeup and passing shot went, and I finally found them! This train is heading to Superior, WI on the now abandoned Soo Line just north of Gordon. Description: Got a bit overexposed, but this is the train heading north, and MP 423 is from Chicago to Duluth. Description: Laying over at the west end of the yard. Description: The 328 waits in the hole as a westbound manifest passes at Midland. Description: An eastbound freight at Grand Crossing. Description: A westbound arriving Stinson Yard. Description: An eastbound freight approaches Grand Crossing. Description: SOO 745, 770 on #205 pulling out of Medary Siding at Grand Crossing. 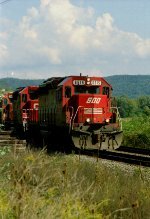 Description: In another scene that was rare for its day, a pair of 700-series SOO units, SD40 745 and SD40-2 770, lead train 205 up the siding at Weaver to meet an eastbound. Description: SOO power leads a monster 167-todays train had 99 freight and 56 stack platforms-into the sun as seen from the shoulder of NY 417 just east of Addison. This shot can only be done late in the day. Usually the sun is on the other side of the train. 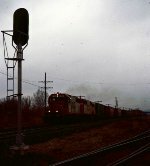 Description: CP 167 rolls along the rocks in the Canisteo valley near Cameron Mills. Description: I dont recall now if I was on a day off, or this was just after work. I had regular hours, but they differed every day. This was taken on a Tuesday, so its likely it was my day off. We start close to home, on the tangent near MP 232 between Campville and Owego, with the red face of a SOO SD leading 167 west into the sun. Description: After getting the 167 at Campville, I jumped down to Smithboro, about 13 miles, taking NY 17 to exit 62, since there was no way I was beating him through Owego. I didnt want to risk getting scooped at Tioga Center, so I ran down to the west end of Smithboro, where the tracks come up to the road. Description: The next jump was an easy one. I just had to step on it. This is the view from NY 17C near the Tioga transfer station at MP 249 between Barton and Waverly. It was a good "grab and go" spot. The third unit is a classic, one of SOO's original SD 40's.